People are buying plastic bottles at a rate of one million per minute. By 2050, it’s estimated the ocean will contain more plastic, by weight, than fish. And while efforts to reduce, reuse, and recycle might be making a dent in those numbers, a whopping 91 percent of plastic still isn’t recycled. Trash in landfills is poisoning our air, and junk in our oceans is killing our marine life. Figuring out a sustainable solution to our trash issue isn’t a simple task. But Synova, a U.S.-based company with technology and sales offices in Europe and Asia is tackling the problem head-on – they’re turning trash into energy or green chemicals. The innovative approach both solves the problem of waste management and meets our growing need for cleaner power and chemicals. Converting waste to energy isn’t a new idea. The concept behind the solution is simple: strip the waste down to its chemical components and turn it into a fuel to meet our growing demand for power. In theory, the process would reduce landfill volume and create a clean, and far more climate-friendly, fuel than oil, gas, or coal. The problem with traditional waste-to-energy solutions is that the seemingly simple concept isn’t so simple in execution. Even the methods with the best of intentions come with costly, inefficient, and toxic consequences. Directly burning waste to make steam power or heat (incineration) can release harmful pollutants, carbon dioxide, and toxic ash into that thin air – often at prices that make it a risky and cost prohibitive investment. Another technique uses a gasifier to create a synthesis gas out of waste. That process creates tars, and conventional treatments that minimize tar production are often ineffective or costly –overall not materially different from incineration. Nailing the combo of a clean and cost-effective waste-to-energy solution seemed just out of reach. That’s when Synova stepped in. The company took a hard look at gasifiers around the planet and attempted to create a more affordable and efficient solution. They came up with MILENA-OLGA, a system that uses four steps to convert waste into fuel and reduce greenhouse gases in the process. First, the waste is lightly processed: water, sand, metals, or recyclables are removed from waste to produce a feedstock. Next, this feedstock is gasified in the MILENA gasifier, creating a dense synthetic gas. Then, that gas is cleaned in the OLGA system, removing contaminants including tar. Finally, that clean gas can be used to produce power via an engine or gas turbine to create electricity, both of which are far more efficient than a boiler at any given scale. Removing impurities before use allows the gas to be used in many other ways. 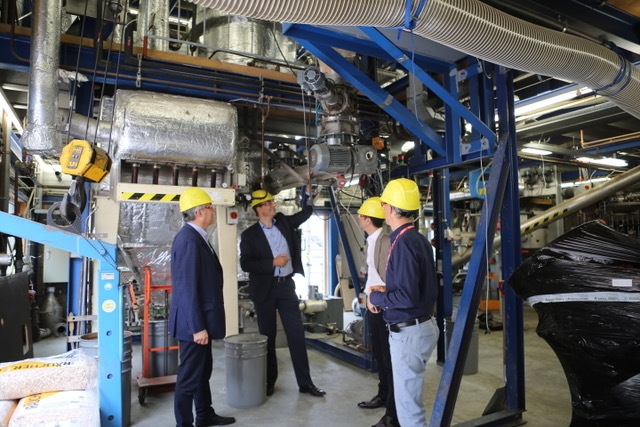 Units to synthesize natural gas or harvest renewable plastic feedstocks or fuels are also demonstrated and will soon be commercially available.